Roy grins, "You don't know if I'm going to or not. With me....expect the unexpected." She said, taking up her stance again. Location : Hiding from my parents. Don't tell them. Since Roy has not moved yet, Dragava squirts some acid at her from behind her defenses. Roy quickly jumpped out of the way, glancing around, surveying the area. "Hm...is that the best you can do?" She taunted, throwing a few kunai's. "Probaly, because most of my attacks cannot damage a puppet. That may just be an excuse by me, though..." A few strong acid sprays manage to send the kunai in another direction. "Then what's your next plan...?" Roy asked, jumping up onto a nearby branch and leaning against the tree. "Hm? I don't know. I can't hit the puppet directly, because I have to pay for it, but I can't hit you directly because the puppet is there to defend. All I can do is make it up as I go along." Dragava looks at the branch, and decides to weaken it by squirting some acid at it. She then squirts acid at nearby branches as well. Roy quickly jumped off the branch and made her way to get behind Dragava, holding the katana to her neck. "You need a plan if you want to beat me..."
"Eh, I think I have to go with what I come up with on the spot. By the way," Dragava formed a protective bone layer under the skin of her neck, just in case. "My tail, remember?" Dragava flicked her tail behind her and sprayed more acid at Roy. "I grew the sack on my tail for a reason. " Roy grinned and stood there, "Like you said, your acid can't harm a puppet..." Her voice said from in front of Dragava. "Hiya~!" She added, throwing explosive tags at her and her puppet, Kouhi. "I never said that, I said most of my attacks won't work. Makes sense considering how I usually attack with claws, suffocation with my tail, horns, and such. The acid I use might not damage immediately, but it can wear out the puppet... It's made of wood, right?" Dragava raises another defensive earth wall, "Also, acid can cause irritation to eyes, so best be careful," Dragava responds, squirting some more acid at Roy. Kouhi was still holding the katana to Dragava's neck, and as Roy backed up she said, "You forgot about the Queen..."
Kouhi pulled on the katana a bit, slightly slicing Dragava's neck. "Chakra through the strings, through Kouhi and through the katana...can cut almost anything." Roy sighs as she pulls Kouhi away, leaving a few scratches on her. "Hn...Well, based on what I've seen, I think I know where to put you." Dragava shrugs, "Is this battle over? Too bad, I was planning to surprise you with some foul-smelling liquid. I can't say that this was a good match-up for me, though." Dragava heals her scratches before pausing... "Is that poison?" 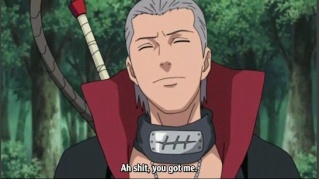 "Ah...no no no....No poison....But you're going to be in the Chunin group....kay?"